Morgan took up the fiddle while attending the Violin Making School of America in the mid ’70s. He then moved to SanFrancisco to study bow making in 1978-79. 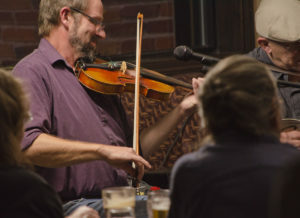 The inspiration to focus on tradition Irish music came from playing in Sunday sessions at The Plow and the Stars lead by Kevin Keegan and hearing many fine players play in the same establishment on Fridays and Saturday nights during those years. 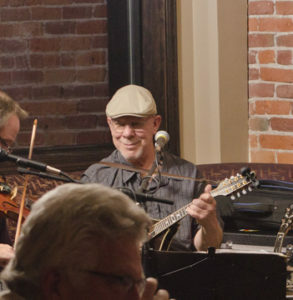 In 1980 he returned to his native western Washington and continued playing Irish music in various situations until moving to the Spokane area in 2004 where he met the other Crowbars. When not sharing a pint and tunes with his cohorts, most of his time is spent making bows for the violin family of instruments. More about that can be found at andersenbows.com. James was born in London and grew up all over the world, mostly in southeast Asia. He has explored many musical paths, from reggae to jazz to classical Japanese music. He is a deshi of Tsurugi Kodo and also of Yoshimura Komei, shakuhachi masters in the Kinko Ryu. 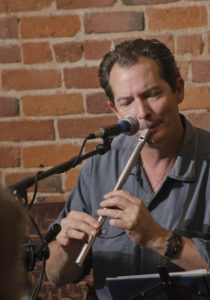 James has been dabbling in Irish music since the early 90s, when he accidentally bought a whistle in a music shop on Portobello road in London. The shop owner convinced him that he’d need some guidance, so he also purchased a copy of “Whistle Wizardry” by Vinnie Kilduff. From the first note of “Sean sa Ceo”, he was hooked. One thing led to another, and before long he was deep into Irish flute, bodhran, and uilleann pipes, on which he describes himself as “crap”. He was a founder member of Celtic Nots, playing with them for fifteen years or so before joining Floating Crowbar. James’ day job is professor of applied linguistics and teaching English as a second language. He works at Gonzaga University and his research interests include corpus linguistics and second language acquisition. Rick was born in Oceanside, California and lived all over the USA because his father was a Marine Corps officer. From a young age he showed a musical curiosity. He has a photo of himself holding a broom as if it were a guitar in his chaps and cowboy hat. His parents finally gave in and got him his first guitar when he was 12 and since then he’s continually had his hands on one fretted instrument or another. He always had an avid interest in European art and music and as a child was fascinated by pictures showing lutes and other early instruments. He studied Renaissance lute with Donna Curry while living in Los Angeles in the 1970’s. Around the same time he decided to study lutherie and began a career that he practices to this day. He’s built a fair number of lutes and has repaired fretted and bowed stringed instruments since 1975. He was introduced to British Isles music while living there in the late 1960’s and to an active interest in Irish music by his good friend Jack Lindberg of Toppish in the 1980’s. He explored DADGAD guitar tuning while transitioning from lute back to guitar and uses it exclusively in his playing with Floating Crowbar. He feels that Irish music is a deep well full of expression and humanity and knows he has barely scratched the surface of it. He’s deeply grateful for its influence and the joy it brings. Don comes from Michigan. He grew up in a musical family: his mother played violin, his father was an instrumental music teacher, and his older brother played tuba. His first instrument was a small melody flute, followed with piano, then trombone in school band. He heard many kinds of music around the house, from jazz and swing to the classics. As a teen, he studied at Western Michigan and at Interlochen School for the Arts. The family moved to California when he was fifteen, and everything changed. He listened to the music of the 60’s, and lived around the corner from Buck Owens. His musical palette expanded to include country and bluegrass, learning first on his mother’s fiddle, then expanding to mandolin shortly after. 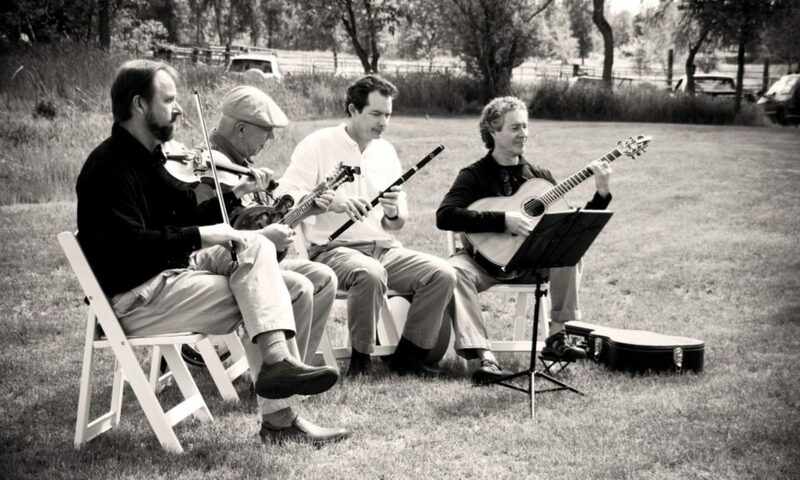 The early 70’s brought the first exposure to Irish Music, and a move to Washington State, and the seed planted then has grown into a real passion for the Music of Ireland. 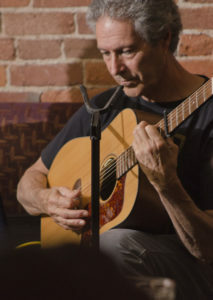 The current group started with Don and Rick playing as a duo, then adding Morgan, and finally James, to become the lineup for Floating Crowbar.